I have a dilemma: all motorcycle safety training stresses not getting on the bike when you're not in the right frame of mind, especially when you're angry. But because of things at work, I'm walking around with big honking piles of anger all the time. So to ride or not? I did yesterday and the results weren't good. In less than a mile from my house I got into a big screaming encounter on a single lane bridge when six cars failed to yield the right of way to me which I had at the time. After counseling the lead driver on his road skills (the lack of which he acknowledged after I explained it to him), I thought about turning around and riding home. But I continued on and once I began floating through an isolated state forest road, the anger melted away. So I'm stupid to take the first few miles of a ride now, but OK after that. Next weekend I'm taking a Motorcycle Safety Foundation Advanced Riders' Course. Pennsylvania just began offering it last year. I signed up then but got sick at the last minute. I'm curious about this one--I've taken what used to be called the Experienced Riders' Course (and is now called the Basic Riders' Course II) four different times, so it has declining utility for me. I would like to get in some longer rides. I just upgraded my ten year old camera and have been quite pleased with the results. These were all shot nearby on my short after work rides. I have two articles to write this weekend so only a short ride for me. I did get into what is a typical online argument on motorcycle safety, this one strangely enough on a sports board. A yutz there claimed he put straight pipes on his bike as a safety feature. Having had this argument many times before, I pointed out that none of the organizations in the United States, Europe, Canada, Australia or elsewhere concerned with motorcycle safety, whether the Motorcycle Safety Foundation, the state highway safety organizations, state police, or insurance companies, recommend loud mufflers as a safety feature. Yet all do recommend high visibility clothing, full protective gear, especially a full face helmet (preferably white), getting regular professional safety training, regularly practicing skills like fast stops, and developing a hyper defensive riding still with minimum distractions. I asked Mr. Straight Pipes if he did those things. I haven't received a reply yet. After spending the last few months of winter in meticulous planning for the three day Virginia-West Virginia ride I wanted to take in April, I ended up cancelling it. The tires on the bike were almost shot. I thought I would get a replacement set under the one year warranty that I purchased when I got them, but I was a few weeks past it. I decided that I couldn't both pay for the new tires and the trip. As it turns out, I probably would have cancelled for weather reasons anyway. Between weather and health issues, I did the least riding over the winter of 2012-2013 since I began in 2008. Spring was more than welcome. 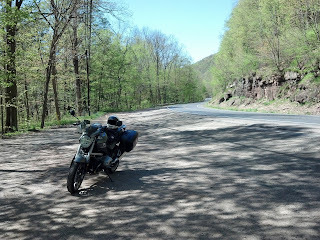 I have again gotten in a few 300+ mile Saturday rides the past couple of weekends, the first west of Carlisle out the fantastic section of Route 30 and up to Raystown lake, the second to the World's End state park east of the Susquehanna and then through coal country around Shamokin. The weather was great for both rides but, as has happened so often over the years, my Garmin Zumo GPS screwed me. It added random diversions and detours to the routes I had designed and uploaded. I tried stopping then restarting the routes but then they became hopelessly corrupted and I had to just ride until I figured out where I was. This has been an ongoing problem as long as I have had a GPS on the bike. I've contacted Garmin multiple times but the company simply denies the problem. As one of their tech support people said to me, "That can't be happening." Well, it has happened to me dozens of times, maybe more than a hundred. All I want is a device that takes the route I designed and runs it--I don't want Garmin to "improve" or shorten it for me. Here's an illustration. I just designed a route using Garmin's bizarrely bad Base Camp software. The program shows it as 72.5 miles and taking 2 hours, 2 minutes. I then transferred it to my Zumo. On the Zumo, the same exact same route shows as 74.9 miles/1 hour, 36 minutes. I'm going to ride it later today after I draft my weekly column and would not be surprised if detours and short cuts that I didn't design show up in the route. I simply cannot understand why Garmin can't find competent software engineers who can successfully integrate mapping software and the GPS devices. I would dearly love to throw the Zumo away and move to something else, but there is no serious competitor. The only other motorcycle-specific GPS is the Tom Tom Rider, and I can't even figure out if it's still being sold in the United States. And this is more than a nuisance. 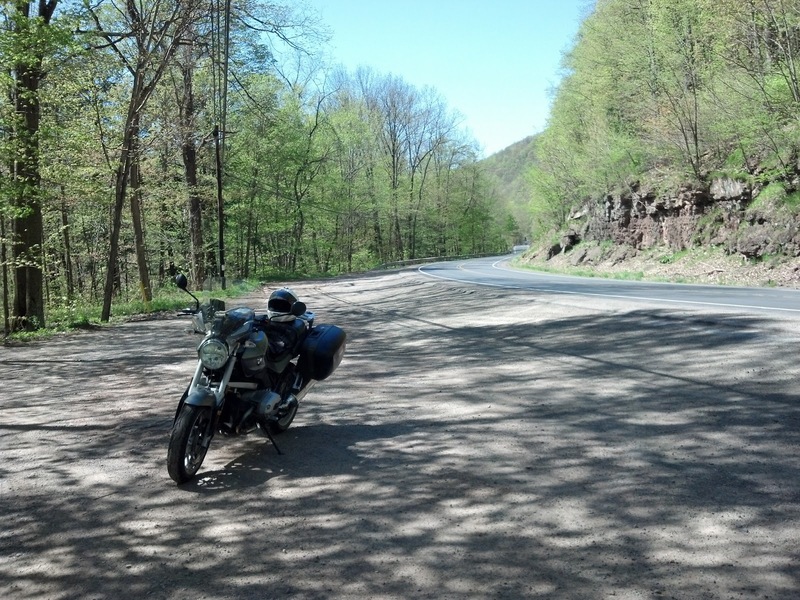 When the GPS screws up, I tend to become so angry and distracted that I lose my concentration and my riding erodes. Yesterday I had a near miss when a yutz ran a stop sign and pulled out in front of me while riding through a town. He avoided a crash by hitting the brakes but if I hadn't been distracted, I would have been in control of the situation and wouldn't have had to depend on the driver to prevent diaster. Speaking of which, in June I'm taking the advanced safety course that Pennsylvania began offering last year. I've taken the basic riders' course and what used to be called the advanced riders' course (which was a compressed version of the same thing) four times. Those courses are useful but limited--since they're given in a parking lot, speeds never exceed 20 MPH so it doesn't replicate real street riding. This new advanced course is at higher speeds, so may be more helpful. That means it requires a bigger course, so I'll have to go to Gettysburg to take it. I also need to get out on a isolated road and practice some fast stops and U turns. I may do that today. I'll continue to try and do long Saturday rides, leaving Sundays to write my column for World Politics Review. Hopefully at some point I'll be able to do a multi-day ride. There is one other thing. While my R1200R remains my favorite physical thing I've ever owned, I'm just starting to look ahead. It has 43,000 miles which is young for a BMW (and I have about 78K total in a little under five years of riding), but I'm beginning to think that it might be a good idea to move away from a sporty bike that compels me to ride hard and fast, and shift to a bigger touring bike. In the 1990s I drove a 3 series BMW sedan which forced me to drive fast. I have five wrecks in the five years I owned it. I traded it for a larger sedan, first an Audi A6 and now a BMW 528i and haven't had a wreck in either. So there may be a BMW K1600GT in my future.